Title: Open Questions in Cosmology. Author: Gonzalo J. Olmo (Editor). Reference: Hard cover, 334 pages, Publisher: InTech, Published: November 12, 2012. ISBN 978-953-51-0880-1. Abstract: In the last years we have witnessed how the field of Cosmology has experienced a metamorphosis. From being essentially the search for three numbers (the expansion rate, the deceleration parameter, and the cosmological constant), it has become a precision science. This scientific discipline is determined to unravel the most minute details of the elementary processes that took place during the most primitive stages of the Universe and also of the mechanisms driving the cosmic expansion and the growth of structures at the largest scales. To achieve these goals one needs not only the development of new experimental and observational techniques but also a deep understanding of the underlying theoretical frameworks. 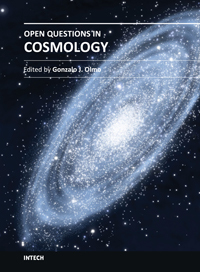 This book gathers the work of leading experts in these fields and provides a broad view of some of the most relevant open questions faced by Cosmology at the beginning of the twenty-first century.